By Daniel Horowitz--The death toll from Typhoon Haiyan in the Philippines has increased to 5,500, with more than 26,000 injured, close to 1,800 people reported missing, and more than a million homes destroyed. Authorities fear the death toll will climb since emergency workers continue to retrieve more bodies as they clear debris. More than 3.5 million people were displaced by the typhoon, which slammed into the eastern Philippines with record winds of more than 300km/h on November 8. Upon news of the tragedy, United Jewish Appeal of Greater Toronto quickly launched its Philippines Typhoon Relief Fund, which has already raised more than $184,000, all of which will go towards supporting the life-saving work of IsraAID, UJA’s partner agency, which has a had a team of professionals on the ground since the typhoon struck. 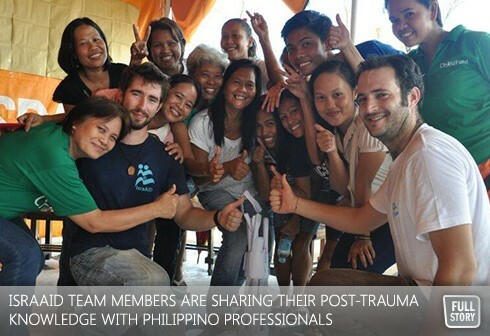 After tending to the humanitarian needs of those victimized by the typhoon, the IsraAID team this week began a psychosocial program in Ormoc, Philippines, with 50 local professionals, among them daycare teachers, social workers, government employees and community leaders. “This program enables our local counterparts to learn from Israel's decades of experience in post trauma treatment,” explains Shachar Zahavi, the Founding Director of IsraAID. To contribute to UJA's Philippines Typhoon Relief Fund, please visit http://ujadonations.com/Philippines or call 416-631-5705.